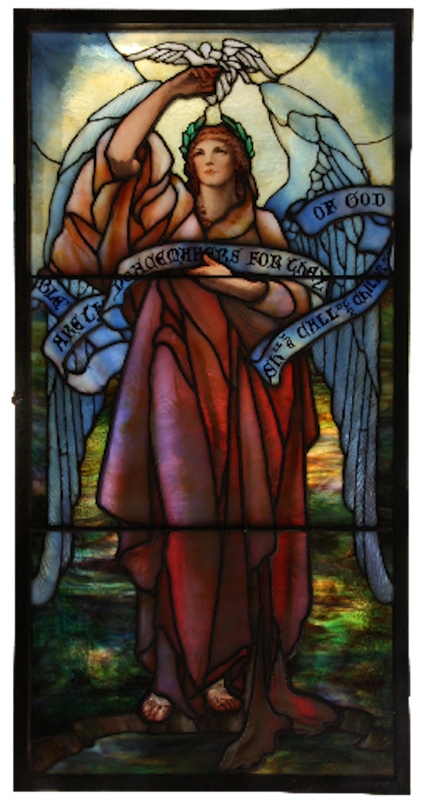 The expected star lot of Fontaine's Auction Gallery's September 10th auction in Pittsfeld, Mass., promises to be an outstanding set of eight early 20th century Tiffany Studios windows, depicting The 8 Beatitudes of Jesus. Tiffany craftsmen utilized multiple layered glass to create these beauties, including drapery, enamel decorated and cameo cut glass. Each 28 inch tall by 23 ¾ inch wide window depicts an angel figure with opaque blue banners having purple cameo cut scripture (from Matthew 5: 3-10). They will be sold as one lot, with an estimate of $400,000-$600,000. The windows are housed in their original bronze frames, with hinges and latches. One window is signed in cameo, “Tiffany Studios, New York.” A frame on another is signed, “Tiffany Furnaces.” One other lot in the sale is also expected to hit six figures. It's a large Chinese teak and porcelain floor screen, 68 ½ inches tall, with profusely decorated center panels and in excellent condition, with the original finish. It's estimated to realize $80,000-$120,000. The auction will also feature many important antique lamps and clocks. Visit www.FontainesAuction.com. Original, hand-drawn cartoons for daily and Sunday papers don't get tossed in the trash once the strip appears in print. Just the opposite. These wonderful pieces of ephemera are stored away and sold at auction later on, in many cases. Consider Philip Weiss Auctions' Thursday, Sept. 8th auction, at their gallery in Lynbrook, New York. Three headlining lots in an already packed sale will be original Sunday page comic art from the 1930s for Flash Gordon, Popeye and Krazy Kat. All are black and white, pen-and-ink illustrations by renowned illustrators from the period. Krazy Kat, a character that was both influential and popular, was drawn by George Herriman (1880-1944). Flash Gordon was drawn by “the artist's artist,” Alex Raymond (1909-1956). Popeye was drawn by his creator, Elzie C. Segar (1894-1938). 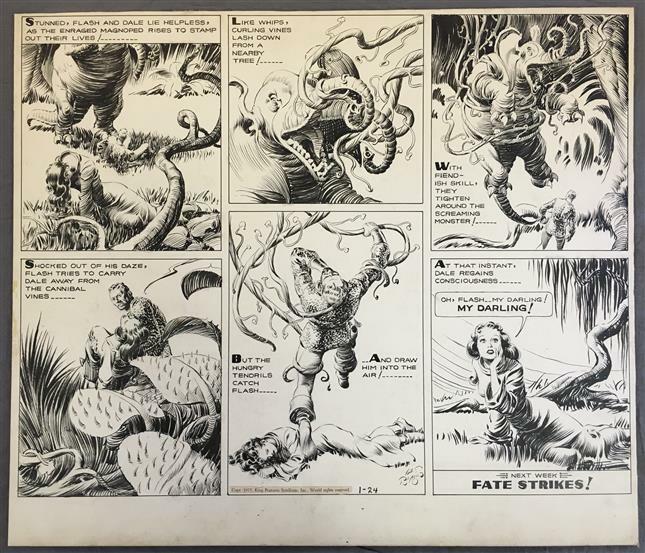 The sale will also feature drawings by Joe Kubert, a legendary artist in his own right. Perhaps the king of all the comic strip illustrators is the late Charles Schulz, author of the Peanuts strips. Ironically, Philip Weiss usually features at least one Schulz strip in his auctions, just not this one. Visit www.WeissAuctions.com. 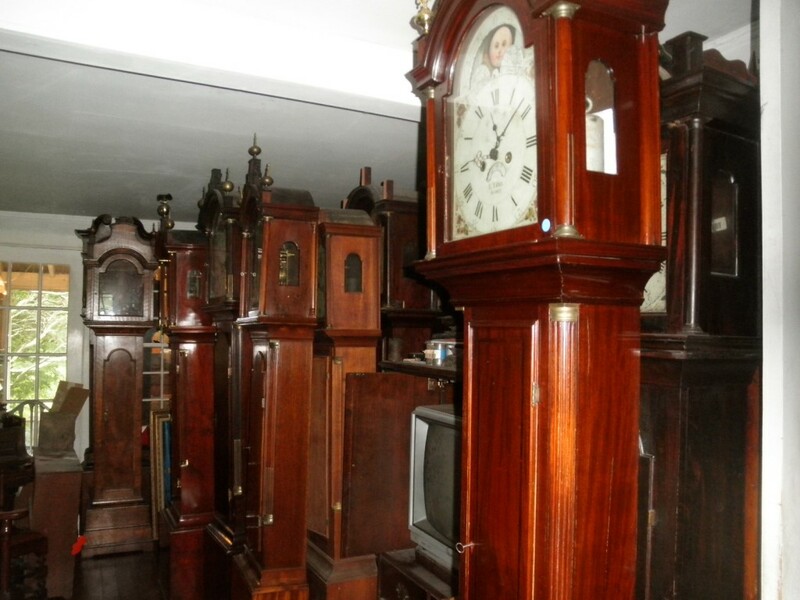 When Connecticut auctioneer Tom Schwenke arrived at a stately 17th century colonial home in Roxbury, he knew it contained some old clocks, but he was unprepared for what unfolded before him: a veritable horological hoard, with many tall clocks lined up in rows in the first floor rooms, banjo clocks literally stacked on top of one another, piles of mantel clocks everywhere, and chests and other case pieces filled with banjo clocks – good ones. Oh, and the dozen or so vehicles parked outside were also filled with mantel clocks. Everything will be sold on-site, Aug. 19-20. It was a find that Mr. Schwenke called “the most unbelievable collection of American clocks I have ever seen or heard of in my 45 years in the business.” The live-only sale (no internet bidding) will feature over 50 American tall clocks (including examples by Simon Willard, Aaron Willard, Elnathan Taber and Jacob Willard); 100+ pillar and scroll and Empire mantel clocks (by makers like E. Terry, Silas Hoadley, Eli Terry, Jr. and others); 24 banjo clocks (including four L. Curtis examples); and 100 shelf, bracket and mantel clocks. Visit www.woodburyauction.com. TV shows like Storage Wars are enormously popular because they appeal to the treasure hunter in all of us. The moment of truth, when the contents are revealed, is like watching a contestant on Let's Make a Deal choose between door number one, two or three. There could be a new car for the lucky picker, or maybe a goat-drawn cart. Court-ordered auctions of abandoned safe deposit boxes can be just as thrilling. While the element of surprise normally isn't there (the contents are usually revealed prior to sale), the promise of a snapping up a big bargain certainly is. Doyle New York is holding such an auction, in just a few days in fact: on Thursday, August 18th, in their midtown Manhattan showroom, at 175 East 87th Street. Nearly 1,000 lots of jewelry, watches and accessories will be sold, with a special section devoted just to items from abandoned safe deposit boxes, by order of Bank of America. 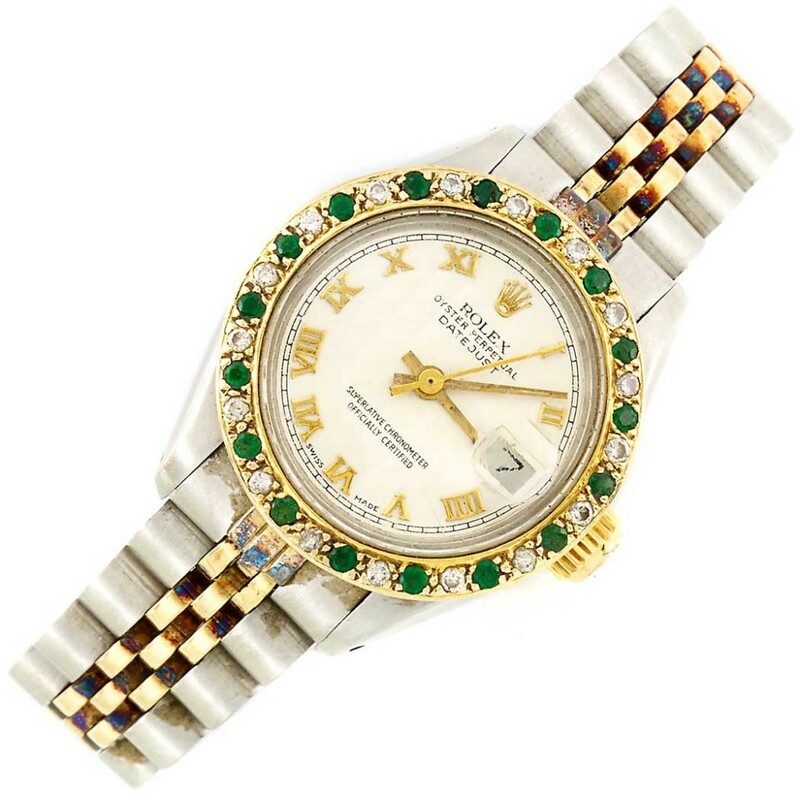 An example lot is shown here: a lady's Rolex stainless steel, gold, emerald and diamond wristwatch, with 17 round emeralds and 17 round diamonds. Doyle has assigned it a modest estimate of $1,000-$1,500. Visit www.Doyle.com. When people speak of antique folk art, they're not talking about traditional art but items that were never intended to be art for art's sake at the time of their creation, but became so over time. Examples include weather vanes, old store signs and carved figures, itinerant portraits, carousel horses, fire buckets, painted game boards, cast iron doorstops and many other whimsical antiques. Today, such items are hugely popular and highly collectible, based on their artistic merit. Which is ironic, since manufacturers then stressed function over form. 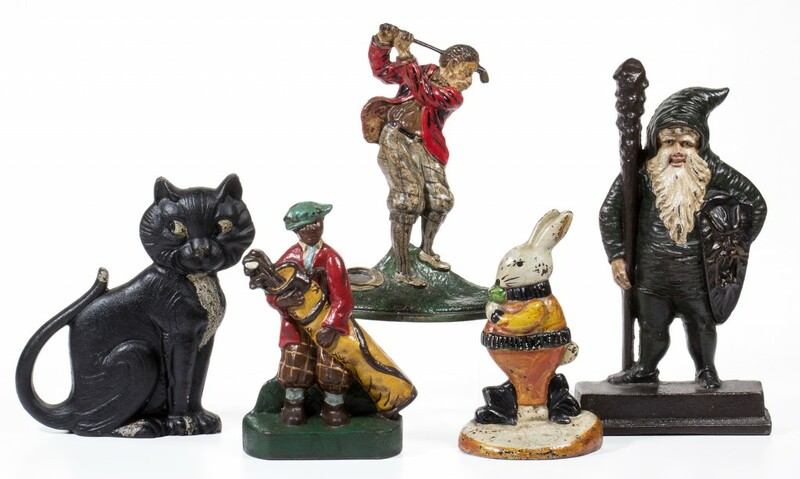 At Jeffrey S. Evans & Associates' upcoming Variety Auction on Saturday, August 27th, some rare doorstops will come up for bid (as will some equally scarce cast-iron mechanical banks, another expression of antique folk art). Doorstops come in all types of designs. The earliest known doorstops were used in Europe in the 1600s. Most doorstops sold today are cast iron and were made from about 1890-1930. Most are shaped like people, animals, flowers, or ships. Reproductions and newer examples are sold in gift shops. Visit www.jeffreysevans.com.